Kevin James and Adam Sandler at the Mexico City press conference for I Now Pronounce You Chuck and Larry. The two actors dressed casually for the event. 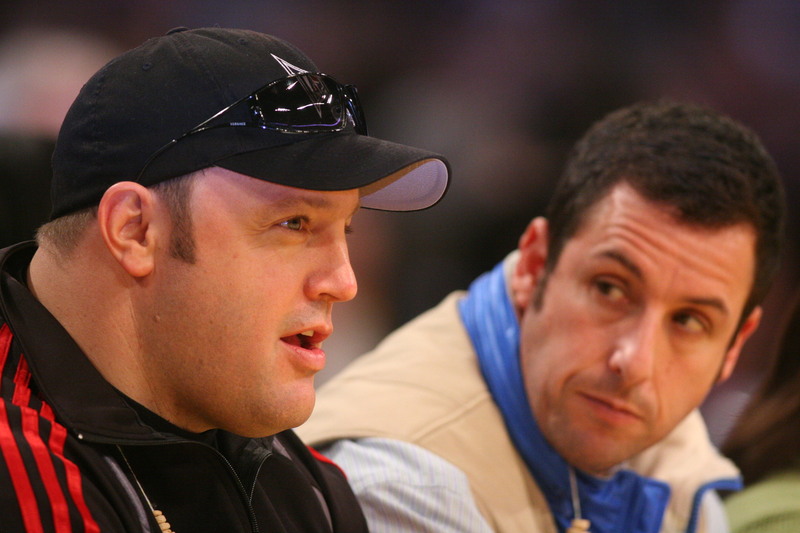 Adam Sandler peers over at a hustling Kevin James. Kevin James is wearing a black-on-black look while Adam Sandler goes casual at the Paul Blart: Mall Cop premiere. 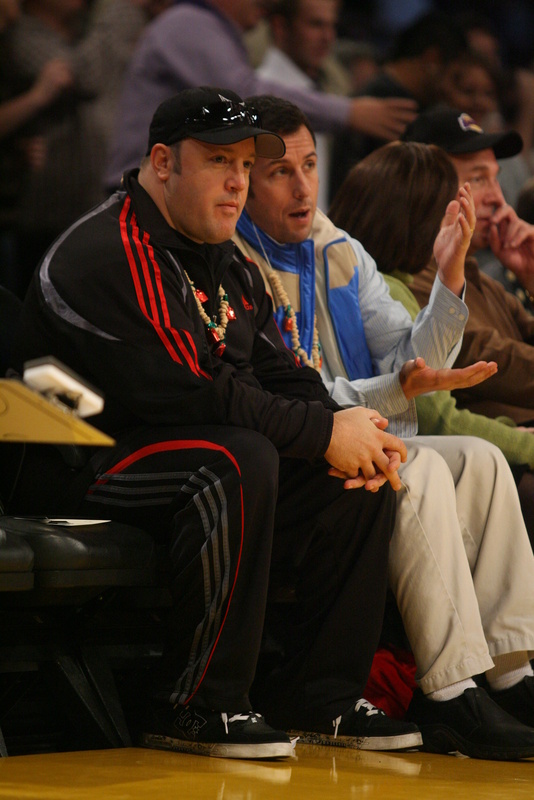 With sunglasses on his hat, Kevin James speaks with Adam Sandler at the Los Angeles Lakers game. Adam Sandler talks to Kevin James while watching a Lakers game at the Staples Center. Kevin James and Adam Sandler laugh and smile on the set of I Now Pronounce You Chuck and Larry. 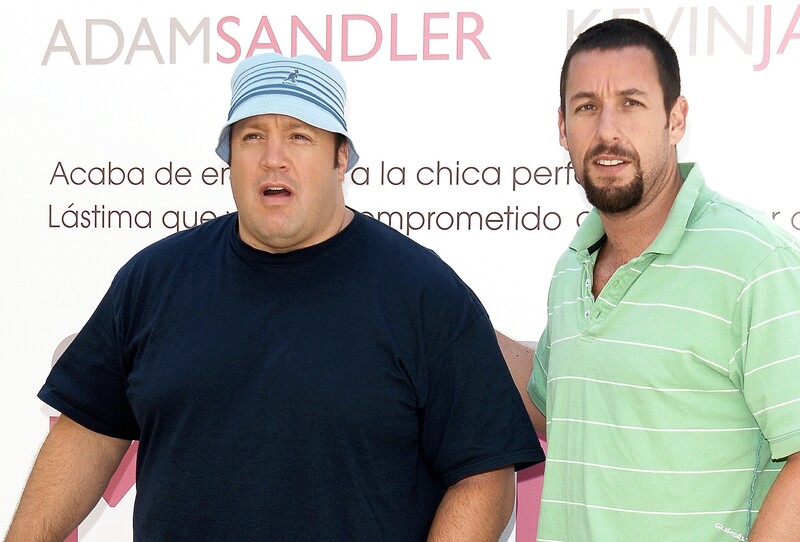 With a light blue floppy hat, Kevin James stands next to Adam Sandler and looks surprised. The two comedy actors attended the I Now Pronounce You Chuck and Larry premiere in Mexico City. Wearing a goatee, actor Adam Sandler smirks at Kevin James. Adam Sandler is dressed up as Dracula, while Kevin James is dressed up like a big, red apple in a scene from I Now Pronounce You Chuck and Larry. Kevin James gives the camera a thumbs up while standing next to Adam Sandler at the Mexico premiere of their comedy film, I Now Pronounce You Chuck and Larry. In the movie, the two play straight guys pretending to be a gay couple. Both wearing athletic apparel, Kevin James and Adam Sandler are spotting while laughing. 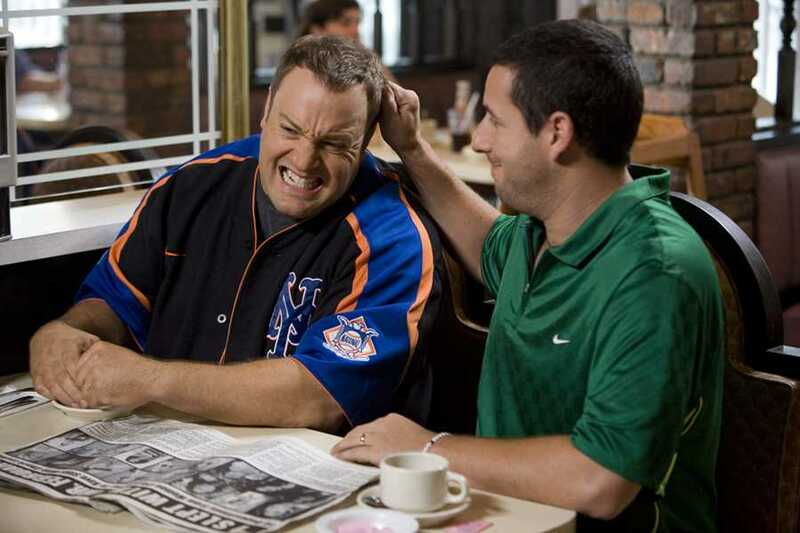 Dressed in a green Nike shirt, Adam Sandler pulls the hair of Kevin James. Adam Sandler has his arm around Kevin James as they appear at Universal Studios for the premiere of I Now Pronounce You Chuck and Larry. 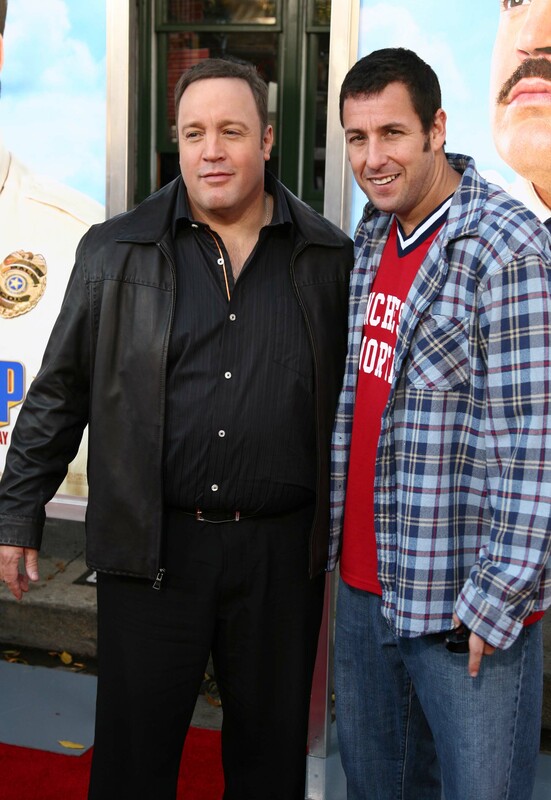 A close-up view of Kevin James standing next to Adam Sandler at the Universal Studios premiere of I Now Pronounce You Chuck and Larry. 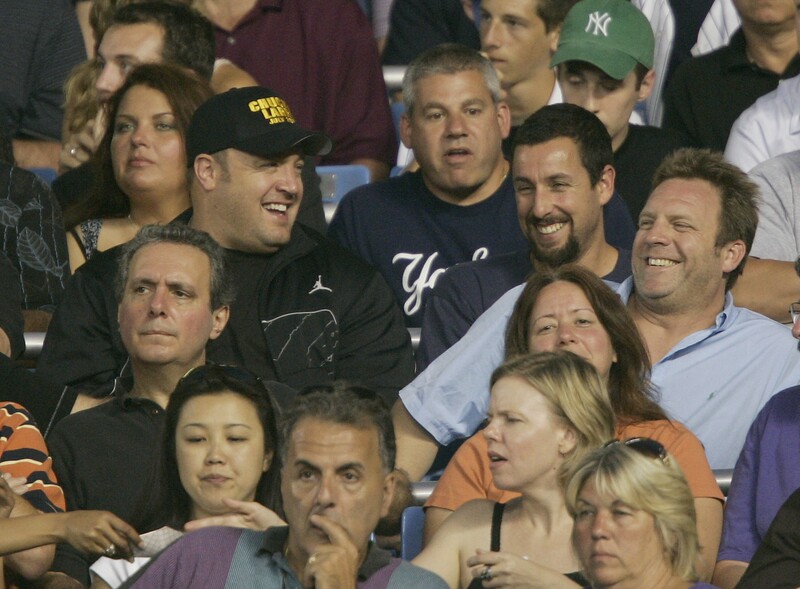 Kevin James and Adam Sandler begin laughing while sitting in a crowd at the ball game. Actor Kevin James talks to co-star Adam Sandler on the red carpet of Universal Studios for the I Now Pronounce Your Chuck and Larry premiere. Adam Sandler standing next to a squinting Kevin James at the Los Angeles premiere of their film, I Now Pronounce You Chuck and Larry at Universal Studios. Kevin James makes a funny face while looking at Adam Sandler at the I Now Pronounce You Chuck and Larry premiere. The funnymen play two straight guys pretending to be gay in the movie. Wearing a fireman hat and a black tux, Kevin James carries Adam Sandler. Sandler is wearing a white tux. The photo was used for movie posters and other press materials for the film, I Now Pronounce You Chuck and Larry. 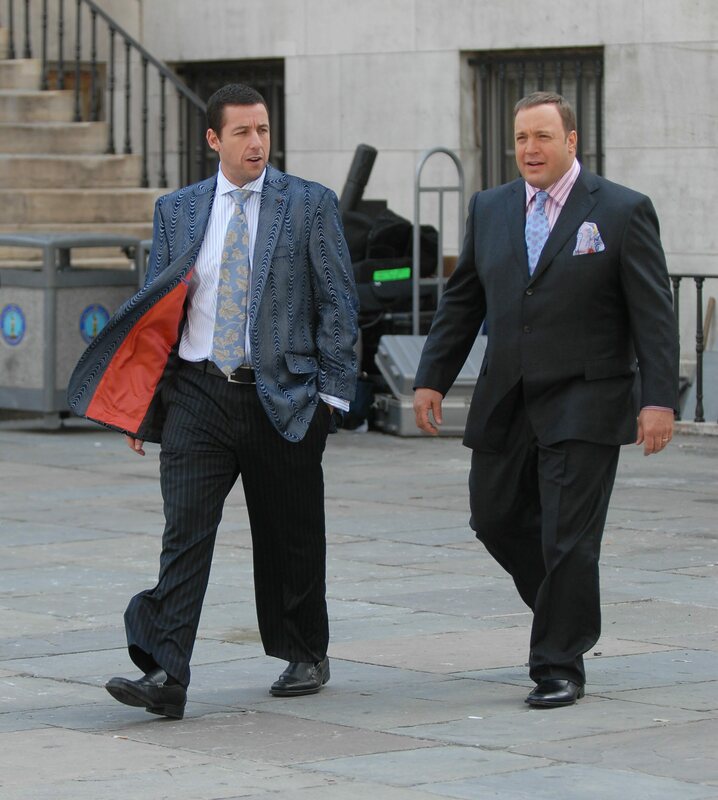 Adam Sandler and Kevin James walking while wearing loose-fitting suits. 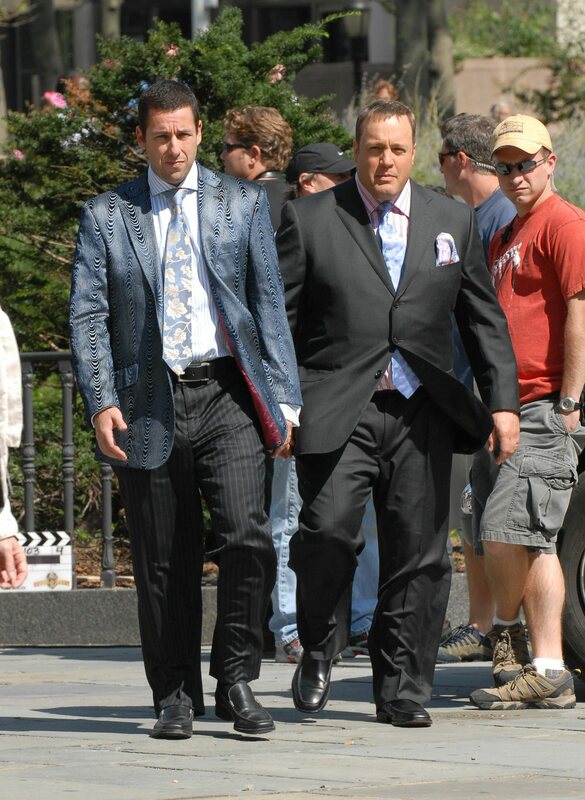 Adam Sandler and Kevin James, both in suits, walk on movie set. 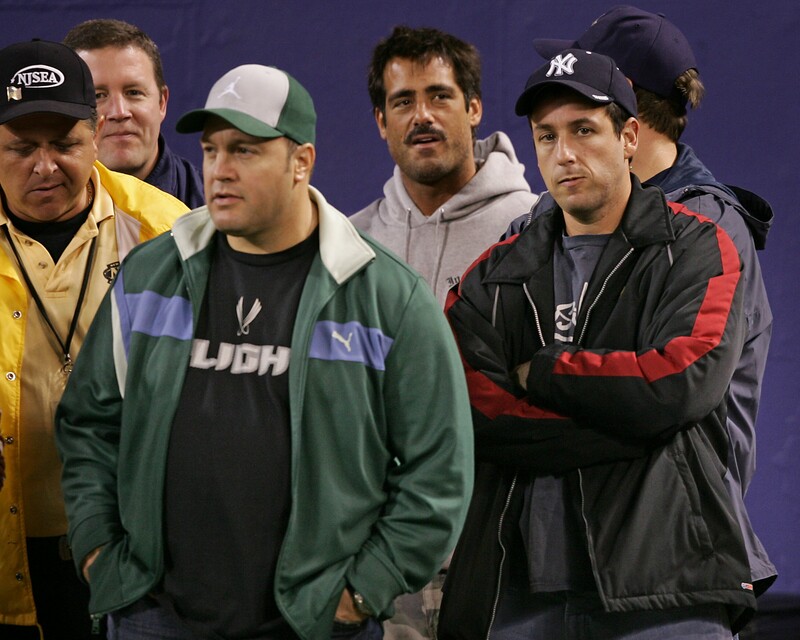 Adam Sandler and Kevin James stand next to security guards while at a football game. 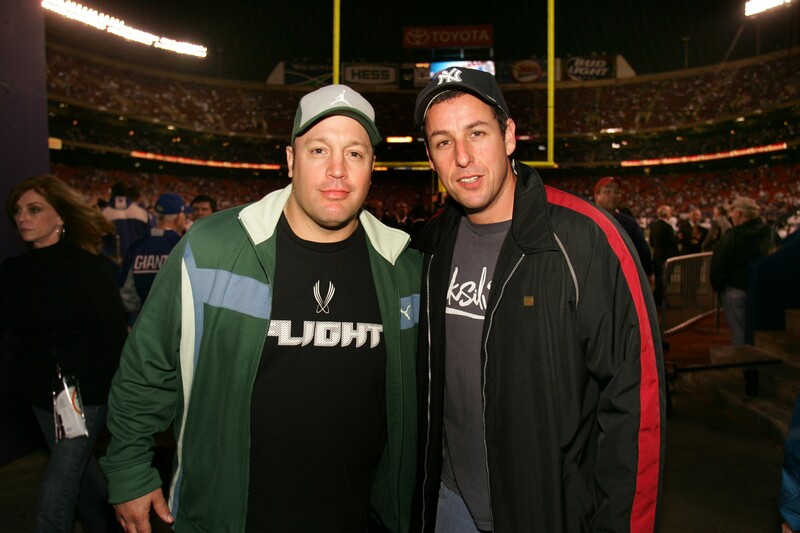 Adam Sandler and Kevin James take a picture in front of goal posts at a football game. 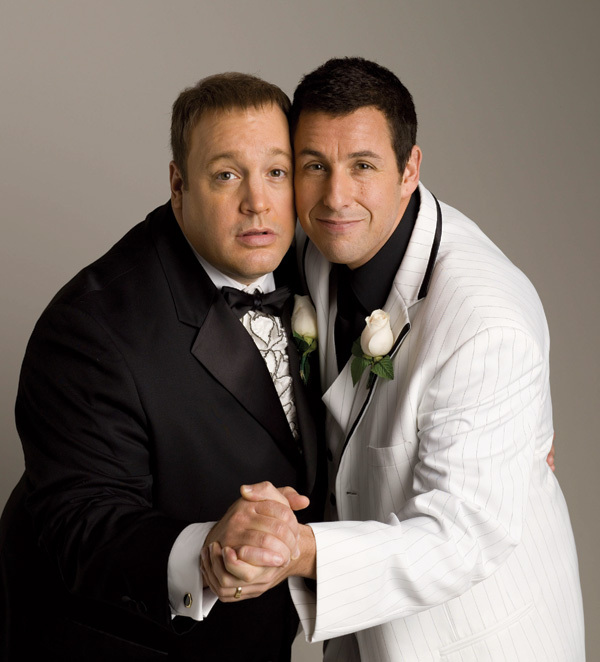 Adam Sandler holds hands with Kevin James as they dance at their wedding in a promo picture for the film, I Now Pronounce You Chuck and Larry. Adam Sandler obviously struggles as he attempts to lift Kevin James off the ground. Sandler is pretending to carry James over the threshold. The twosome play straight gays pretending to be gay for insurance reasons in I Now Pronounce You Chuck and Larry. 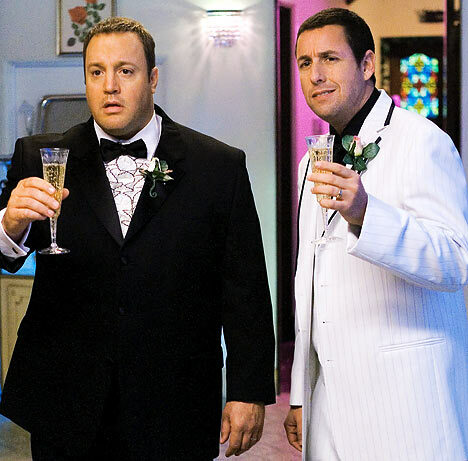 Both holding a glass of champagne, Adam Sandler and Kevin James have surprised facial expressions in the film, I Now Pronounce You Chuck and Larry. 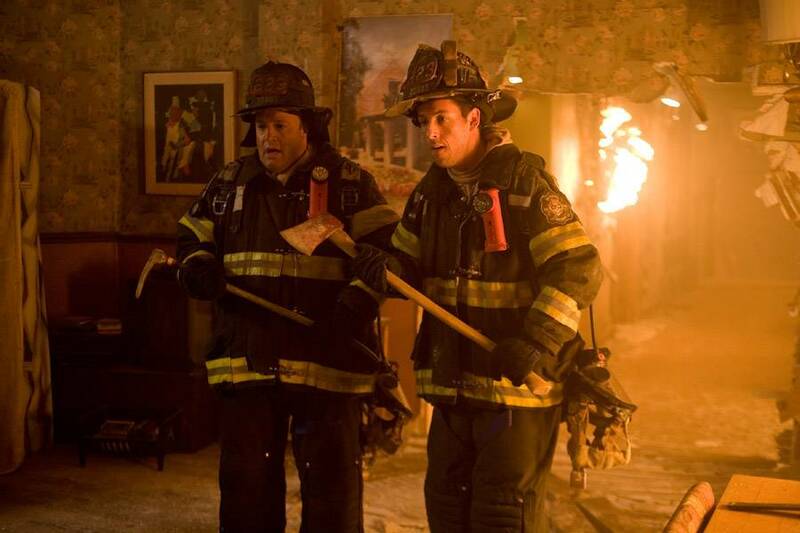 Adam Sandler and Kevin James are firemen holding axes inside of a burning house in the movie, I Now Pronounce You Chuck and Larry.